I didn't exactly anticipate erupting into tears during a crowded, mid-weekend yoga class a couple of years ago. To be clear, I was in a great mood when I unfurled my mat, opting to make the most of a very relaxing Saturday afternoon with my favorite kind of workout. But then, in Pigeon Pose, it happened: My left hip joint popped into place with a distinct thud that I won't soon forget, and suddenly, my eyes began swimming—not with pain or even discomfort, but some kind of nameless but nonetheless overwhelming emotion. It wasn't the first time I had cried in yoga, which has served as a consistent place of comfort and refuge during troubled moments in my life. But I had never before experienced this kind of spontaneous emotion facilitated exclusively by, it would seem, physical movement. That notion had seemed rather woo-woo to me—yoga speak that didn't quite resonate. It was only after this particular experience piqued my interest that I learned just how closely our physical and emotional bodies are intertwined—a mind-body connection that scientists have explored extensively. Soon, I began to observe the ways my emotions were manifesting beyond the chatter of my mind. My jaw, I realized, was particularly painful during more chaotic times at work. A tension headache became a good indicator that I was repressing sadness or anger. Our bodies are highly intelligent; they do a fantastic job of telling us when we're avoiding something. It's just up to us to pay attention. "We can all recall a time when we got sick, fell ill, or experienced bodily discomfort as a result of stress," says Lauren Eckstrom, yoga instructor and executive director of Inner Dimension Media. She emphasizes that the reverse is also true. "Can you remember a time when you were restricted from doing something you love because of physical tension? For example, imagine you love to go hiking but were prevented from going outdoors because of a migraine. These are reminders that physical tension can add to our mental distress and cause us emotional pain and suffering." 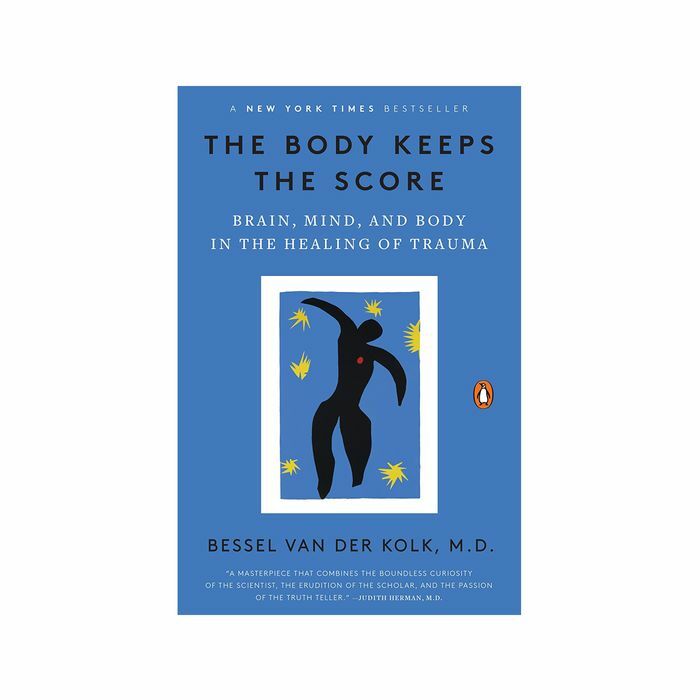 If you're interested in diving deeper into the vast topic of the mind-body connection, Eckstrom recommends The Body Keeps the Score ($15), a best-selling book that explores the ways in which the physical body "remembers" stress and trauma—even that which we think we've left behind. "You can feel reconciled about something in your mind, on an intellectual level, but as the title of the book suggests, the body literally keeps the score and holds an imprint or memory of your history," she says. "By moving your body in mindful, non-inflammatory ways, such as through a yoga practice, you help these emotions to move, surface, and ultimately release." Eckstrom notes that before diving into specific methods of physical release, step one is slowing down in general. "The frantic pace at which we move through is a form of anesthesia, numbing us with business and causing us to avoid the hurt that might still be held in the body," she says. Gentle, deep stretching—and even simply observing where we're holding physical tension in the body—invites us to take a breath and check in on ourselves in a meaningful way. In turn, we're better able to address any dormant feelings that come up. Keep reading to see how to address three common areas of emotional tension in the body. "Your upper body, from your shoulders to your head (neck, face, jaw), are associated with your current stresses and emotional tensions," says Eckstrom. "You might experience headaches, TMJ, or painful knots in your shoulders as a result of daily stress, anxiety, and general overload." Jaw tension is so commonplace that it's easy to become desensitized to it. It took me years and a professional opinion to realize just how much stress I house here. The link between emotional duress and jaw pain (as well as teeth-grinding) has been extremely well-documented, and symptoms can radiate far beyond your mouth. Any of the symptoms mentioned above by Eckstrom are definitely solid indicators of jaw tension, but there are a couple of other ways to gauge it at home. Try placing your pointer fingers where your jawline meets your ears, and press gently. Similarly, relax your jaw and press your pointer fingers into the sides of your cheeks, where your jaw hinges. If you feel tension or pain during these exercises, then your jaw is probably worth addressing. There are tools like night guards (and even Botox) to help alleviate this pain, but in order to tackle this tension for the long haul, it's worth training your awareness to any clenching or grinding so that you can nip it in the bud. Whenever you think of it, try placing your tongue to the roof of your mouth to help your jaw relax. You can also gently knead your knuckles into the sides of your face. If you frequent yoga at all, you've probably heard your instructor refer to hip-openers as poses that inspire release. "Your lower body, specifically your hips, [is] associated with your longer-held emotional history and upsets," says Eckstrom. "Metaphorically, it's said that we literally sit on these emotions and consequently store them in the lower region of the body. Your hips are the biggest joint in your body and make the perfect storehouse! For many people, this understanding can help explain why tears or emotions seemingly surface while practicing yoga." That's why when you're feeling down, scattered, or generally "stuck," it might be worth investigating any physical stagnation via some gentle hip stretches. One of my go-tos before bed is Supta Baddha Konasana, which involves simply lying down flat on your back, bending your knees, and pressing the soles of your feet together so that your outer thighs are flat on the ground. Interestingly enough, you can also find release in your hips by way of your jaw. "Synchronistically, your jaw and your hips are associated with the same region in your brain, so when you are moving through a hip stretch, bring attention to your jaw and encourage your face, tongue, and hinge of your jaw to be soft and easeful," says Eckstrom. "This is one of the reasons why laboring women are encouraged to sigh, moan, and soften their jaws; it helps further release the pelvic region of the body through the waves of contractions." "The backline of your body—think glutes and hamstrings—consists of muscles that tense when you go into protection or survival mode," says Eckstrom. "You activate these muscles when you need to stand a little taller, prepare to run, or otherwise protect yourself. As a result, these generally tight, constrained areas are a major reason why many people begin a yoga practice in the hopes of alleviating long-held patterns of restriction and inflexibility." To that end, while trying to release tension in your backline (these stretches are highly effective for doing so), don't forget to extend your awareness to your mental chatter as well. "When working toward releasing these tender areas, it's helpful to speak kindly, patiently, and compassionately to yourself," says Eckstrom. "Imagine the muscles in your body are like a very small, scared child. You would never scream, 'There's nothing to be afraid of!' to a frightened child. Instead, it's more soothing and productive to speak in a way that's reassuring and calming." This, she notes, is perhaps the most invaluable element of releasing physiological tension in general—to treat both the physical and mental aspects of your stress with equal amounts of respect and compassion. "Speaking to yourself and your body with this level of love will help activate the parasympathetic side of the nervous system," she says. "This in turn allows muscle tension to fade, flexibility to increase, emotions to release, inflammation to decrease, and restoration to take place." Next up: the case for taking a mental health day.